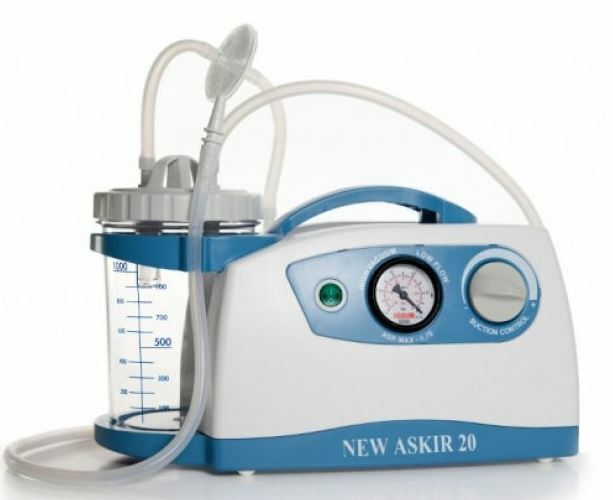 ASKIR 36BR is a portable suction unit for the aspiration of body liquids, oral, nasal and tracheal aspiration in adults or children. For professional use and with a powerful aspiration of max 36 l/min, ASKIR 36BR is lightweight for easy transport. Three different options for operation: AC/DC adapter, rechargeable battery and 12V makes it a versatile suction unit approved for NON-STOP operation without overheating. Provided with visual and acoustic alarm indicatinglow battery level, the main unit is also equipped with vacuum-meter (bar & kPa) and vacuum regulator. Carries IP21 degree of protection and complies with EN 60601-1-11 “for use in the home healthcare environment”.